Purpose – This article concerns a developmental experience in the water sector, namely the introduction of water metering in an Indian city, in the framework of a French water company’s technical assistance to the local public water authority. We address the impact of the introduction of the water meter, an object that crystallizes a symbolic part of the management model of the French company, on the local water supply context and socio-political environment, focusing in particular on how trust between the users and the service providers is reconfigured. Methodology – The methodology consisted of an exploratory field survey with 37 households in the pilot water metering area. Findings – The water meter is an artefact highlighting users' perception of water and society. The user reinterprets its function, mainly perceiving it as a tool to monitor the consumption of water, dissociated from the dimension of payment. As soon as the issue of payment based on consumption comes into the picture, then the trust the user has developed in the private foreign company is displaced towards the public authority. Objet – Cet article porte sur une expérience comportementale dans le secteur de l’eau. Dans le cadre d'une mission visant à fournir une assistance technique à une compagnie des eaux publique locale, une société de distribution d’eau française a mis en place des compteurs d’eau dans une ville indienne. L’aspect principal de cette expérience a porté sur la transposition du compteur d’eau, objet qui symbolise le modèle de gestion de l’entreprise française, dans le contexte local d’alimentation en eau et l'environnement socio-politique indien. Nous avons examiné l’impact de cette introduction en nous intéressant plus particulièrement à la modification de la relation de confiance entre les utilisateurs et les fournisseurs de service. Méthodologie – Un sondage qualitatif sur le terrain portant sur 37 foyers dans la zone pilote. Résultats – Le compteur est un objet qui permet de mettre en évidence la conception qu’ont les utilisateurs de l’eau et de la société. L’utilisateur réinterprète la fonction du compteur, le percevant essentiellement comme un outil permettant de suivre la consommation d’eau et non comme un outil associé au paiement. Dès que le paiement basé sur la consommation entre en jeu, la confiance que l’utilisateur a acquise dans l’entreprise étrangère privée se déplace vers l’organisme public. Propósito – Este artículo concierne una experiencia de desarrollo en el sector del agua, concretamente la introducción de la medición del suministro de agua en una ciudad en India, dentro del marco de la Asistencia Técnica brindado por una empresa francesa de suministro de agua a la autoridad pública local del agua. La pregunta central de la investigación concierne la transposición del contador de agua, objeto que simboliza el modelo de gestión de la empresa francesa, al contexto local de suministro de agua y al entorno socio-político. Examinamos el impacto de su introducción, concentrándonos en particular en cómo se modifica la confianza entre usuarios y proveedores del servicio. Metodología – La metodología consistió en un estudio de campo cualitativo de 37 hogares en la zona de medición piloto. Resultados – El contador es un artefacto que destaca la concepción que tienen los usuarios del agua y de la sociedad. El usuario reinterpreta su función, percibiéndolo principalmente como una herramienta para supervisar el consumo de agua, disociándolo del aspecto pago. En cuanto se introduce la problemática del pago basado en el consumo, la confianza que usuario ha desarrollado en la empresa privada extranjera se traslada a la autoridad pública. 2This project is part of the technical assistance provided by a French water company, Veolia Water, to the public water authority, Chennai Metropolitan Water Supply and Sewerage Board (Metro Water), in the city under a twinning arrangement consultancy funded by a World Bank loan from 2000 to 20063. The beneficiaries consisted of the water agency, which is the recipient of the technology transfer, and the users of the water public water supply service in the pilot zone. 3The introduction of the water meter in this case raises the theme of technology transfer from a country of the “North” to an actor located in the developing “South”, referring to the process of diffusion of know-how and techniques between industrialized and developing countries. Such attempts of diffusion of management models and tools are sometimes accompanied by fears of destabilization of the social and political equilibrium in the society receiving the transfer. 4These fears are particularly strong in the case of the management of essential amenities such as water, considered as a right for users in most developing contries, and thus subject to intense debate whenever there is any attempt to subcontract the service to the private sector, be it local or a foreign operator.4 These discussions are even more vigorous when it comes to the reform of the tariff policy, since a significant section of the population relies on the welfare State to assure its essential needs. 5In Indian cities, the piped water supply system is owned by the State and managed by different public authorities (State water board, or, Municipal water supply department). The low quality level of their service provision is characterized by an intermittent water supply (fluctuations in terms of duration and frequency), which does not reach all sections of the population in urban areas. 6There is a set of factors structuring the deficiencies of the public service. From a macro perspective, the Indian urban water supply situation is defined by a political administration of public infrastructure and water resources, deriving from the Soviet development model that influenced India until the early eighties and translating into a predominantly “top-down” rather than a “bottom-up” developmental approach. Decisions generally percolate from the upper level of the administration, without consultation at the lower level of the hierarchy, be they water authorities or local actors (Zérah, 2005: 177): a management logic driving towards constant increase of the water production capacity (“still more water pipes”), requiring heavy investments. The visible infrastructure serves the electoral agenda of the local elected representatives, aimed at highlighting their actions in the field of public services during campaigns. 7But such a position deliberately ignores two fundamental factors that need to be taken in consideration for any investment decision in water supply projects: (1) the assessment of the population’s demand for water and (2) the evaluation of the economic rationale of the project. On the one hand, political considerations largely take precedence over financial viability. On the other hand, there is a lack of managerial tools to evaluate the water production and distribution costs, notably a deficiency of information systems to estimate the demand for water (Zérah, 2003a: 94; Zérah, 2003b: 401; Zérah, 2006: 141). Even when proper information exists concerning the latter, it is rarely correlated or aggregated with other sources of information within the same administration. The absence of a sound managerial approach such as a cost-benefit analysis in the development of the public water supply service has percolated into the managerial culture of the water authorities. 8The authorities are, however, being encouraged to experiment with different management tools to render their service provision more effective, under the influence of multilateral agencies such as the World Bank, which provide them loans to upgrade and develop the infrastructure. Foreign water companies respond with offers to public tenders for the latter. This is how Veolia Water’s technical assistance to the public water authority in Chennai came about. 9Water metering is one of multiple components of this project. It included, upstream, the setting up of gross water metering to evaluate the water produced and supplied in the public water supply network, and downstream, the installation of individual water meters at the level of households to measure water consumption. 10The water meter is an object that crystallizes the centrality of information systems in the improvement of the management of the public water supply service. It helps to better understand and evaluate the demand of water and subsequently to set priorities in terms of investments. 11Since the water meter is a management tool linked to consumption and payment, implemented in this case by a foreign private actor, the socio-political issues raised earlier, concerning the sensitivity of the tariff question and the charge attached to the idea of public service, are central in the effectiveness of the technology transfer. 12It is thus pertinent to examine whether, and how, attitudes to these issues on the part of different actors, especially the end-users of the public water supply service, have shifted over the period of the pilot project. If “tools are not only means of managing, but also means of articulating social relations” (Berry, 1983: 17), an essential characteristic of the water meter is its capacity to redefine the relation between the different actors around the water service, modifying mindsets, creating habits and new behavior (Chatzis, 2006: 175). 13The implementation of the water meter in Paris at the end of the 19th century raised multiple questions in this regard. In particular, what were the effects of the implementation of this tool on the relationship between the user and the service provider? Further, the water meter being a key element in the attempt of passage to a new managerial regime of water supply, its reception by users is also a central question. In other terms, how did users comprehend and interpret the tool? 14In what follows, we confront two points of view, a historical one of the Paris experience, and an empirical one emerging from a field survey of the users of the pilot water metering zone in Chennai. 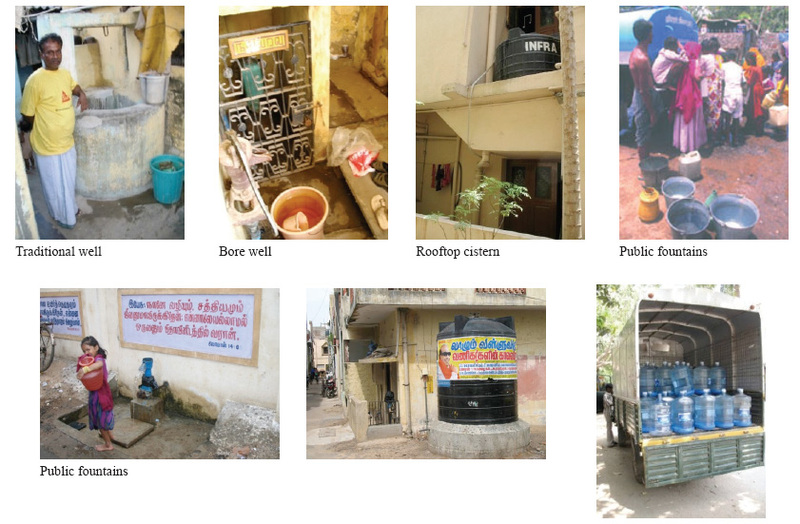 15The public water supply in Chennai suffers from deficiencies at multiple levels, as in many other Indian cities. The problems of supply are exacerbated by recurrent water scarcity, especially during the very hot summers. 16The unequal and unreliable access to water implies spontaneous adjustments of the inhabitants, both individually and collectively: recourse to alternative sources of supply (see Figures 1 and 2), when these can be afforded, and practices of mutual exchange (water sharing). 17Users are also faced with the apathetic service response of the public operator (unaddressed breakdowns and leakages) and often resort to collective mobilization, demanding the mediation of local politicians and/or 'baksheesh' practices for obtaining service. According to Karen Coelho (2005), differential treatment is given by the public operator to user demands, depending on socio-economic status. 18These conditions of water supply imply certain behaviors and practices with an important collective and relational dimension. 19On the management side, a politically determined tariff policy on which a certain number of actors agree, keeps public water supply charges at an artificially low flat rate. But the unreliability of the service implies direct and indirect costs (investment in alternative sources, adjustments to unpredictability of supply), which can offset the practically 'free' nature of public water. On the other hand, neither the public operator nor users themselves have information about the actual consumption of households. 20These salient factors together shape the impact of the pilot project, particularly on the attitudes of users concerning service provision, the main focus of this article. 21Veolia Water installed 1,500 individual water meters in a Chennai locality in 2002, as an experiment which ended at the termination of the consultancy in 2006. 22In the larger perspective, the objectives of the project were conceived in terms of improving the public water supply network, towards an economically sustainable continuous (“24/7”) service promoting a reasoned use of the resource. Concerning the pilot project, specific objectives included the implementation of customer management on a pilot zone, as well as technical goals such as the reduction of water losses, requiring the measurement of consumption: thus the introduction of water metering. A customer service provision to address water supply problems and water meters reading and maintenance, with a concrete and visible presence in the form of a 'field office' that users could solicit. Significantly, users in the pilot area were aware that they were being served by a new provider. 24The finalities of the project take on somewhat different meanings for the two organizations. 26On the other hand, in Chennai, as in many other Indian cities, the approach is to charge a flat fee to users of the public water supply system. As mentioned above, the socio-political context of water supply is marked by certain expectations of the public service and political compulsions as regards water tariffs, and a heightened sensitivity to accusations of 'commodification' and 'privatization' of water (Coelho 2005).7In keeping with this, Metro Water restricted the implementation of water metering in the pilot zone to its measurement function only (testing the tool), without applying the principle of charging by consumption, which would have constituted a veritable change in its model. 27We should note here the multi-functional character of the water meter: "Like clocks or scales, the water meter is a technical object, an information system and a management tool" (Hatchuel, 2000, p.356). But, in the pilot project, only the informational aspect is implemented. Note that even this function of the water meter is constrained by the context of the water supply in Chennai: the public water supply network to which the water meter is attached is complemented by multiple systems of water provision (see below). 29Viewed thus, the water meter is all but a neutral technical object; rather it arrives charged with multiple meanings in the local socio-political configuration: a key tool of managerial reforms, a potent symbol of the putative transformation of public service as it is understood in India. 30Given the above context, the interest of studying the implementation and outcomes of such a project lies in the shifts that it might produce, in spite of its limits, as regards the highly charged questions surrounding the declared objectives of the project. 31The user is confronted with three changes: improved supply; a quantification of his consumption and an idea of its cost9, and an emergent service relation with the new provider. 32How have the improvements in the objective conditions of water supply in the pilot zone reconfigured users' understanding of the value of water, and expectations of service, between the public operator and the private company? To what extent has the pilot experience led them beyond the expectation of practically free water (but poor service), to accept the principle of “paying in return for good service” (willingness to pay)? 33Adopting a heuristic rather than a theoretical approach, we approach these questions on two levels, namely historical and empirical. 34We first examine secondary sources on the introduction of the water meter in France in the 19th century, for a historical perspective on the transformational impact of the tool. The historical literature also provides us with an interpretative key to understand the gradual acceptance process of the new regime of water supply defined by the implementation of water metering. This process of acceptance involved shifts in the relationship between the operator and the users that have been notably characterized in terms of ‘the level of trust’. 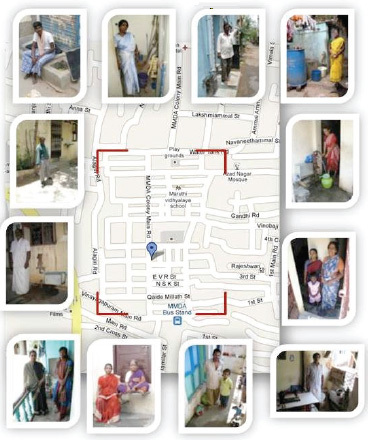 Adopting this perspective, we interpret our qualitative data from an exploratory user survey of households in the pilot water metering zone in Chennai, in terms of a play of trust and mistrust. 35The introduction of the water meter in Paris at the end of the 19th century was a milestone in the evolution of the water supply service (Hatchuel 2000, Chatzis 2006), symbolizing the passage from payment to small private suppliers, to a technical and managerial process promoted by water companies in liaison with public authorities. Indeed, the piped water service which was perpetuated and was modernized took on little by little an economic value in the eyes of the user10. 36These historical facts concerning the impact of the water meter in the context where it was originally introduced, present a methodological interest, highlighting three structuring elements: (1) the payment of water, (2) the nature of water, (3) the system of actors concerning water. The water meter's measurement of consumption serves two purposes: as information for better management of the supply and as the basis for setting water charges. The water meter, however, did not limit itself to the role of accounting. It changed the nature of the water itself from the perspective of the consumer. From a resource denied of any value instituted by a public authority, water became a "consumption product" that the user could use at will. The user was not necessarily conscious of this mutation and of the central role of this service that re-organized his home: "in addition to the ancient fire, water becomes a point of structuration of the domestic space" (Hatchuel, 2000: 356). The introduction of the water meter implied a re-composition of other traditional modes of supply and the system of actors around water: it suppressed traditional water occupations (fountain operators), it changed the relationships between the renters and the owners of the buildings supplied by the public water service, it created new actors, such as the water meter manufacturers or municipal testing laboratories (Chatzis, 2006: 22). 37To approach this transformative potential of the water meter, we mobilize the notion of trust, as characterizing the postures of agents or their relationships. The concept of trust, defined in terms of open and reliable behavior of actors with each other in economic and social exchange, has been evoked as a key factor in the effective functioning of organizational and social life (Cook 2001). 38Trust has been identified as a key element in the acceptance of the water meter in French cities. Successive phases of trust and distrust between the user and the public water authority punctuated the pace of implementation of domestic water meters in Paris at the end of the 19th century (Hatchuel, 2000: 353). The tool was ultimately seen as a viable solution, provided it was accepted by each party within a market exchange agreement between the users (the buyers) and the water company (the seller) (Hatchuel, 2000: 358). 39This suggests the building up of trust between different actors as a pertinent factor in the long term goal of achieving a workable water supply system. 40The empirical findings discussed in this article concern the results of an exploratory field survey of 37 households during 3 weeks in the area of Arumbakkam where the individual water meters were installed. The survey was based on semi-open questions completed by continuous interactions with water users and field observations. 41A questionnaire constructed within a qualitative research framework served as a toolkit to understand the daily water supply situation confronted by the users of the public water supply service. It also served the purpose of deciphering the issues at stake following the installation of the water meter, principally to identify the implication of the changes for the relationships with the service providers and among the users of the public water supply service within the neighborhood. To situate the local context of the survey, we furnish below a description of the pilot water metering zone. “The white sheet”: any meaningful information (both explicit and implicit) that was not covered by the questions was noted down so as to obtain a comprehensive understanding of the water supply scenario and of its context (social, political, economical). 11 The average monthly income of the households surveyed was Rs 6873. 43The households were selected so as to obtain a sample that covers every street of the area and a diversity of housing types representing different income groups11. 44The neighborhood of Arumbakkam is characterized by a diversity of habitat: from traditional huts to modern flats. 45The area is covered by small lanes that are mostly used by peddlers, though the width of the roads allows the circulation of vehicles of all kinds. 46To grasp the meaning taken on by the water meter for the users, it should be evoked within the environment in which it is projected. This environment is characterized by a multiplicity of sources of supply and facilities for drinking water. 47Households in the pilot zone interpreted the monitoring of consumption as a means of economizing water collectively in a context of scarcity. More significantly, the installation of the water meter accompanied by improved supply for all households led them to identify it as a tool allowing equal treatment for all. This underscores the users' aspiration for the principle of a universal service, reflecting broader aspirations for the equality of citizens before the public authorities. This must be seen against the background of unequal access and unreliable supply from the piped network under the management of the public operator: the poor bear the burden of this situation which has several indirect costs, while the better-off are able to procure alternative sources of supply. A continuous water supply would eliminate this inequality. 48On the other hand, users fearing that water was already being charged on the basis of consumptionor anticipating this possibility stopped sharing water with neighbors. This anticipation of a situation that is feared finds a parallel in Paris at the end of the 19th century after the introduction of water meters and the end of the flat rate system (Chatzis, 2006: 17). 49At this point, we mobilize the notion of trust to analyze the shifts in the service relationships between the users and the providers. 50The management model of Veolia Water in India is oriented towards the realization of an efficient water production and distribution system so as to provide a constant water supply service to the user, and a customer-oriented service approach summarized by the notions of approachability, accountability and reliability. 51Let us recall that within the parameters of the project, the company's taking over the service consisted of, one, installing the water meters, without implementing a tariff based on the consumption measured (though a dummy bill was provided), and two, assuring their maintenance and customer relations through an open-window office located in the pilot zone. 52This latter aspect of the company’s intervention was a significant innovation in the existing context. The fact that they could call or lodge a complaint induced a feeling of proximity between the users and the company’s managers, engineers and plumbers, who generally intervened promptly, and were perceived as saviors. Consequently, a feeling of trust was expressed while referring to the management of the water supply service by the company, marking a shift in the residents’ sense of themselves as beneficiaries of the service: they felt better considered by the provider, and concerned in the maintenance of the water supply network. In this sense, the user became a “partner” of the company (Chatzis, 2006: 172), moving to the status of customer and fulfilling to some extent the company’s objective; that is to develop a relationship oriented to the customer. 53These changes in the relationship of user and private provider were also noticed in the case of Paris as mentioned previously, trust in the French context being comforted by articles stipulating the legal obligations between the customer, the water company, and the public authority (Hatchuel, 2000: 358), while the relationship of trust in Chennai needs to be viewed in light of the company's engagement to improve the service with no reference to payment. 54From the user’s perspective, this building of trust with the private operator overshadowed the existing mistrust towards the public operator. 56Metro Water was initially in charge of the water supply in the area prior to the technical assistance. While referring to this period, the respondents regretted the lack of involvement of the public authority’s managers and employees when solicited for a better service (e.g. increasing supply, stopping a leakage). When the company took over from Metro Water’s service in the pilot zone, there was a drastic change in the relationship between the user and the water service provider. The survey indicated a strong disbelief of the respondents in the capacity of Metro Water to maintain the level of service after the end of the technical assistance of Veolia Water. 57The survey reveals the fact that the willingness to pay for water based on consumption does not necessarily depend on the income of the households: the poorest households are not necessarily reluctant to pay more for a better service, and conversely, the richest households surveyed do not necessarily accept the principle of paying for a better service, since they can rely on alternative solutions (e.g. bore well, own well). 58However, as regards attitudes to the service provider, surprisingly, the tacit partnership that emerged between the users and the company and contributed to the build up of trust, was hampered by the fear of a progressive change in the water tariff: trust in the capacity of the company to provide good water service was transformed into suspicion, when the idea of paying for water based on consumption came up. 59The users had a higher estimation of the accountability and the approachability of Metro Water in case of a rise of the water tariff, due to its public status. Conversely, the private foreign company was perceived as an exogenous and less accessible actor if tensions came into the picture, although the majority of the users wanted the company to continue the water supply management in the pilot area beyond technical assistance. 60This subtle shift in the users' mind from trust to distrust towards the company was accompanied by the reverse phenomenon, where trust in the public authority’s willingness to preserve the flat rate system takes precedence over its incapacity to maintain the quality of service after the end of the technical assistance. 61One possible explanation for this phenomenon lies in the users' expectations of public service and more generally, of the State, and conversely the posture of the public service and more specifically elected officials towards users, in contrast to the customer oriented relations promoted by the company in return for a commensurate payment. 14 This situation is widespread in most the cities in India. 62The first refers to the existence of a sentiment in people’s minds in India that has remained constant: a demand for an omnipotent State, with the duty to protect them, the State having until recently an affective dimension in the sense that it was referred to as “ma-bap”, or“mother-father” (Jaffrelot, 2005: 38). In Chennai, these expectations of the inhabitants seem to be even more deeply rooted, partly due to the longstanding populist attitude of local politicians13. This posture could be summed up as “voter oriented” (Ruet and Zérah, 2002: 4): they fix the water tariff in favor of the poorest section of the society for vote bank reasons14. 63In so doing, the local elected members deprive a large percentage of users the access to good water service, since the income generated by the flat rate system in most of the Indian cities permits neither the maintenance nor the expansion of the existing water supply network. 64The pilot project's transformative potential lay in its capacity to effectuate a shift in this tacit pact between the public authorities and the users. 65The main stakes that are highlighted in the results of the study are equal access to water and the issue of payment. Better water supply, the measurement of consumption and a more consistent customer service led to the modification of certain behaviors developed as a response to the deficiencies of the public water supply. 66Has there been a shift in attitudes of users to the tariff question, arguably at the heart of this experiment? What is the impact of the three dimensions of innovation represented by the pilot project, as detailed above (notably, improved water supply from the public network and a service relationship with the private company)? 67The key factors are the posture of users towards the water meter and the service provider, with both positive and negative aspects. 68For one, the favorable view of the new service was offset by the continuing existence of alternative sources of supply in which many users in the sample had invested, restraining the users' willingness to pay for better service from the network. On the other hand, the earlier public supply represented unequal and unpredictable access, and higher indirect costs to the poorer sections. For these, improved supply might reduce dependence on private sources such as tankers, and also reduce indirect costs related to an unreliable supply. 69The water meter is associated with a continuous supply of water, for all households regardless of socio-economic level, rather than payment. It enabled users to become conscious of their consumption, and on a secondary level, of the corresponding charges (the dummy bill), which certain users took as a sign of a prospective rise in tariffs (and consequently reduced their 'gifting' practices, but this could also be linked to the perception of a more plentiful supply for all). But their attachment to the status quo on the flat rate (which they associated with the public operator) was not diminished. Many users simply ignored the dummy bill, associating the water meter only with the measurement of consumption. 70These observations indicate the limits of the impact of the company's service intervention on the tariff question. The truncated nature of this experiment (improved service with no corresponding charges) limit our appreciation of the trade-offs users might have arrived at, between their expectations of better service, and their willingness to pay for it. The survey did not obtain quantitative information concerning recourse to alternative sources of water, which could permit such a comparison15. 71A negative didactic dimension of the Chennai pilot project was that, while convincing the public of the benefits of continuous supply, it also gave the illusion of providing good service for free, modifying consumption patterns in an unsustainable way, and actually might have diminished the likelihood of the user accepting a real reform down the line. 72On another level, the salient result of this survey is that trust is sustained precisely by a situation which does not imply an inversion of values of the different stakeholders. On the one hand the user accepted the service model of the foreign company, but as soon as the issue of payment based on consumption comes into the picture, then the trust was displaced towards the public water authority. 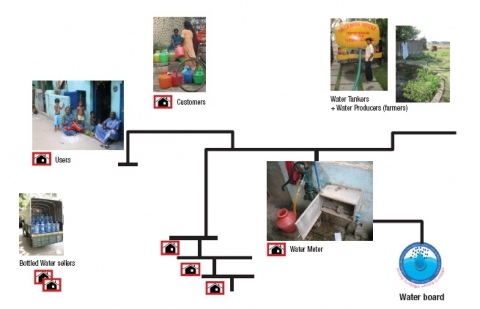 16 The technical assistance in Chennai is the first project Veolia Water developed in India. 73The pilot dimension of the project purveys an image wherein the organizational partners work hand-in-hand without renouncing their respective line: electoral strategy (for the public authority) or the business model (for the private company). They share the same opportunistic attitude within different time spans: a short term vote bank strategy on the Metro Water side, and a mid- or long-term financial gain strategy on the Veolia Waterside16. 74In this context, many users of the water service have transposed their own understandings onto the water meter: beyond its attributed function of measuring the water consumed and the need to save water, the water meter highlights their conception of a society founded on tight solidarity mechanisms at the neighborhood level and their demand for a protective State in the provision of public services such as the water supply. This reinterpretation by the user of the initial purpose of the water meter, allowed him to hedge his trust between the private company and the public authority, in this technical assistance project framework. Barraqué, B. (2005), « Eau (et gaz) à tous les étages : comment les européens l’ont eue, et comment le Tiers Monde pourrait (ne pas) l’avoir ? » Séminaire Iddri-Cerna, Accès aux services essentiels, Paris, 14 janvier (communication non publiée). Berry, M., (1983), Une technologie invisible ? L’impact des instruments de gestion sur l’évolution des systèmes humains. Ecole Polytechnique, Centre de Recherche en Gestion, Paris, 60 p.
Chatzis, K. (2006), « Brève histoire des compteurs d'eau Paris, 1880-1930 », Terrains et travaux, n°11, pp.159-178. Coelho, K. (2005), “Unstating the public ethnography of reform in an urban water utility in South India”, in: D. Mosse and D. Lewis (eds. ), The Aid Effect: Giving and Governing in International Development, Pluto Press, London, pp.171-195. Cook, K. S. (2001), Trust in Society. Russell Sage Foundation, New York. Hatchuel, A. (2000), « Les métamorphoses de la confiance dans l’échange marchand. Petite histoire des compteurs d’eau », in: R. Lauffer and M. Orillard (eds. ), La confiance en question, L’Harmattan, Paris, pp. 353-370. Jaffrelot, C. (2005), « L’Inde comme démocratie de marché », Le Débat, n°137, novembre-décembre, pp. 23-39. Ruet J., Zérah M-H. (2002), “Organisational analysis of Board and Municipalities: Lessons from Calcutta, Chennai, Delhi and Mumbai”, Paper presented at the Water Management seminar organized by the Centre de Sciences Humaines, New-Delhi, 17th December 2002, 22p. Ruet, J. (2006), « Réformes et nouvelles économie politique en Inde », Critique Internationale, n°32, juillet-septembre, pp.189-207. Shiva, V. (2002), Water wars: Privatization, pollution and profit. South End Press, Cambridge, 158 p.
Wilk R. (2006), “Bottled water: The pure commodity in the age of branding”, Journal of Consumer Culture, November, vol. 6, No. 3, pp.303-325. Zérah Marie-Hélène (2003a), « Dix ans de libéralisation de l'économie indienne : les effets limités de la gouvernance dans le secteur de l'eau et de l'assainissement en ville », Autrepart, n°.27, pp. 91-106. Zérah Marie-Hélène (2003b), « Gouvernance métropolitaine et pilotage de réseaux techniques : le cas de la région métropolitaine de Mumbai », Revue française d’administration publique, n°107, pp. 395-408. Zérah Marie-Hélène (2005), « Enjeux d’eau en Inde. Des effets allocatifs et redistributifs complexes entre usagers et territoires », Sciences de la société, n°64, février, pp. 174-193. 1 Chennai, also known as Madras, is the capital city of the Indian State of Tamil Nadu with a population of 4.6 millions inhabitants in 2011 (source: Census of India, provisional population results). 2 The water meter is not quite new in India, having been introduced in a few cities (such as Mumbai, Hyderabad, and Bangalore). In Chennai, water meters existed in the 1970s and were removed for unclear reasons. 3 The existence of the technical assistance project resulted from a solicitation of Metro Water which called upon assistance from the World Bank (as funding agency) and Veolia Water (as service provider) to address efficiency shortcomings arising out of insufficient personnel training, unsuitable management tools and inadequate management system. 5 Before the technical assistance, water was supplied from 6 to 8 in the morning. In 2006, at the time of our survey, only one half of the households surveyed were provided water continuously by the public water supply network.However, this project is claimed by the Veolia Water to be the first successful continuous supply pilot project by any water utility in India. 6 The projects subsequently developed by Veolia Water in India are paving the way for a more business-oriented activity. The company succeeded in obtaining 'performance contracts' with water boards in certain other Indian cities, where “the main challenge was to prove the feasibility and economic interest” of continuous water supply, in terms of the expectations of the inhabitants and their willingness “to participate financially in return for good service”. 7 Where it concerns multinational corporations and the World Bank, a heightened resistance is generally put up by local NGOs and activists often based on a confusion between the privatization of services with that of resources, at best considering the privatization of the water services as the first step towards privatization of water (see: Shiva, 2002). This confusion is also observable in the case of anti globalization movements in Europe (Barraqué, 2005: 2-3). 8 Metro Water officials resisted disclosing any information about the reasons for their involvement in the project, when contacted for this study. This may either be due to sensitivity of the issue of water supply management in Indian cities or merely the reluctance of managers to discuss an experience that was innovative at the time. However, the ethnography of the organization by Karen Coelho (2005) provides valuable insights into the reforms at work. 9 A “dummy bill” was sent to the user on a monthly basis. It indicated the volume of water consumed by the user and the corresponding charges, which would have been applied under consumption based billing. 10 This universalized public service does have a ‘competing’ private source of drinking water, reflecting « a contest for authority and public trust between governments and corporations » (Wilk, 2006: 303-325), that is bottled water companies. 12 Veolia Water proposed to Metro Water to extend the installation of water meters to 30,000, in new pilot zones in Chennai. According to the company’s managers, the negotiations were going in the right direction; however the project was abandoned a few months before the end of the technical assistance due to lack of political support. After the departure of the company, the water meters in the pilot zone were abandoned. There is no evidence of any follow-up project. 13 The arrival of a new Chief Minister in Tamil Nadu state generally gives rise to inflated electoral promises. In the 1964 electoral campaign, the candidate M.G. Ramachandran sang in a chorus: “if I am elected Chief Minister, everything will be free”, including water and electricity by charging the rich sections of the society. 15 Claims have been made that users' overall expenditure for water diminished, taking into account the payments for private supplies and indirect costs such as loss of wages incurred while queuing up for public supply.